I live in the “new” part of my town. I doubt any building in this area is over fifteen years old, homes included, and that’s fine by me. I like newer communities, personally. When we lived in our old house, it was just that–an old house, dating the early 50’s. When new homes popped up nearby, I was SOOO jealous of the obviously rich people living in the big, new looking homes. Of course, I also assumed everyone who lived in one was rich but now know that’s not the case, but whatev. If you could afford a home with two bathrooms, you were rich in my book! Now, to get to the “older” area of town (where my college is and nearby where Jessie lives) I have to go through residential neighborhoods on particularly long stretch of roads Jessie and I call “Death Valley” because it’s annoying and 25mph the whole way and feels like it takes FOREVER to get to the main road. But one day, I found a shortcut street that no one drives down which means it doesn’t exist on the space/time continuum, obviously, and which means yours truly usually bends the speed limits a little and goes a couple notches above 25 (and by a couple, I mean in the 15-25 above that range). I know it’s bad and against the law but I’m always looking out for kids and pedestrians and cops, of course. But it SO beats driving behind gramps or some goody two shoes who can’t bear to push the pedal beyond 23. But lately, someone must have mentioned something to their fellow neighbors, friends, family, baristas, hairstylists, and everyone else in their address book, because now this street is ridiculously populated with cars ALL THE TIME. It’s like Death Valley, but worse, because this was like, my personal Nascar track and now it’s a slow-moving parade of cars. So lately, I’ve been actually driving the speed limit (sorry, Mom!) and it’s kind of funny. In fact, yesterday, I turned down the street behind someone adamant about going below 25 and I nearly lost it until I realized, this is the actual speed limit. People are actually supposed to drive this fast. It makes me wonder how they determine the speed limits, because in some regions of our town on residential streets, the speed limit is 35, or 40-45, even. How come some streets are 25 while others are 40? Are the people living on a 40 speed limit street like, more badass and mentally equipped to deal with people speeding down their street day and night? Are the 25’s only old people, kids and weirdos who do things by the book only?? Why can’t we just have hovercrafts already so I can just speed in the streets while everyone else flies in sky traffic?! It’s 2012. We are supposed to have Rosie-like maid robots like in The Jetsons and as far as I’m concerned, my brother is not named Rosie, nor a robot, nor vacuums so I’m kind of upset about this. Anyway, my normal 15-minute commute was extended by a good 10 minutes because I drove the speed limit and the moral of the story is, my annoyance and dislike for the speed limit is no excuse for speeding, BUT it does get me home quicker so I can make yummy treats like these super easy Lemon-Strawberry Petit Fours. 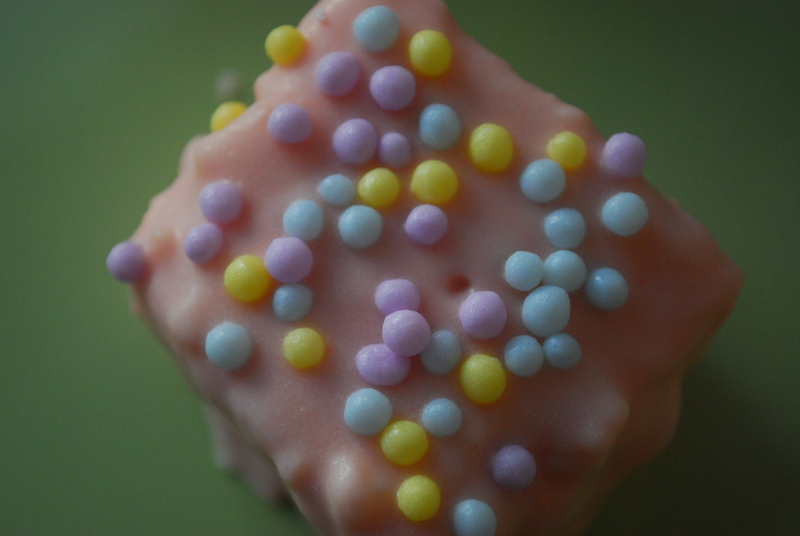 Do you know what petit fours are? Me either, except that they’re little stacked cakes, usually with a fruit jam or curd filling, and coated in candy coating or chocolate. They’re adorable, two-bite treats that remind me of miniature tea parties or something and only look super fancy. 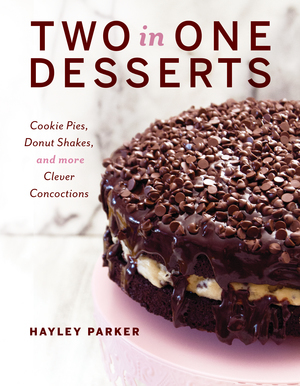 Sheesh, I used a prepackaged pound cake for crying out loud–this ain’t no black-tie affair, but it is a black-tie dessert made simple. Plus, the cake-jam-coating mixture is totally versatile, so mix things up based on your taste preferences or what you have on hand. 2. Cut each crustless pound cake slice in half, then in half again (making four square slices). Repeat process with remaining pound cake slices–just don’t use the end pieces. How many slices/pieces depends on the size of your pound cake, how thick your slices and how many you’ll get. Just know that three slices goes into one petit four. 3. Spread a small smidgen of lemon curd onto two squares and stack them. Stack an unfrosted square on top. You should have three stacked squares, two of which have curd. The top square should be dry. Repeat until all cakes are frosted and stacked. 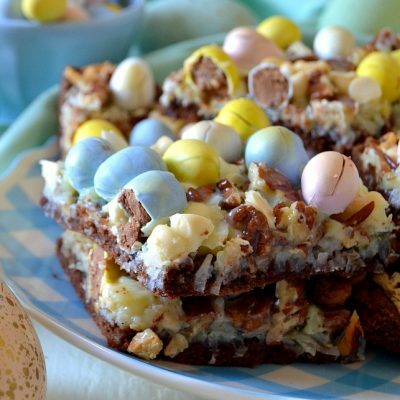 You may have squares leftover; eat those or save for another use. 4. Freeze the petit fours for approx. 1 hour until chilled and solid. In a large bowl, prepare the candy melts according to package directions until smooth and melted. Stir in the strawberry shortcake mix until combined. 5. 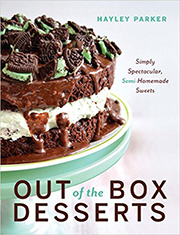 Dip the frozen petit fours into the chocolate mix, coating thoroughly. Remove with a fork and allow excess to drip off before placing onto the foil-lined baking sheet. Sprinkle with assorted sprinkles, pearls or jimmies. Repeat until all have been dipped and sprinkled. Allow the candy coating to harden before eating. Store leftovers airtight for about 2 days. These make excellent little treats for coworkers, teachers, neighbors or friends–and like I said, the flavors are totally versatile. I love lemon & strawberry together since they’re so reminiscent of spring and are so fresh, but feel free to try chocolate and almond, key lime and lemon, raspberry and lemon, raspberry and white chocolate, strawberry and chocolate–whatever you like! Have a wonderful day, my petite pals! You are on a roll with those packets. You rock. 🙂 I do not understand the speed limits either – I think they change them up all the freakin’ time so that the police will catch us and get rich. Why else would one street be 35, the next one be 25, and then back to 40? These are now on The List. I did pick up some of the flavor pkts last week, but not sure where I hid them. Hum. Somehow, though, I think the pound cake will have Grand Marnier or ??. Or, maybe be cotton candy vodka! I followed you over from Pinterest and everything look delicious. I would like to invite you to share this, and any other posts, on my link party at http://www.michellestastycreations.blogspot.com. Have a great weekend. Yum! 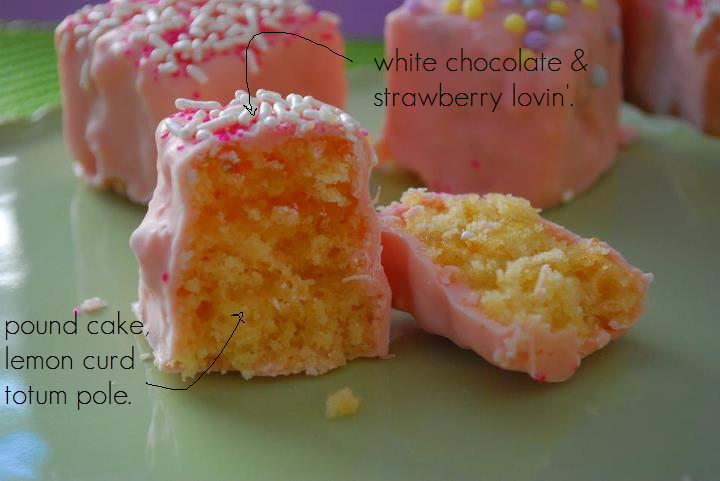 I cannot wait to make these. 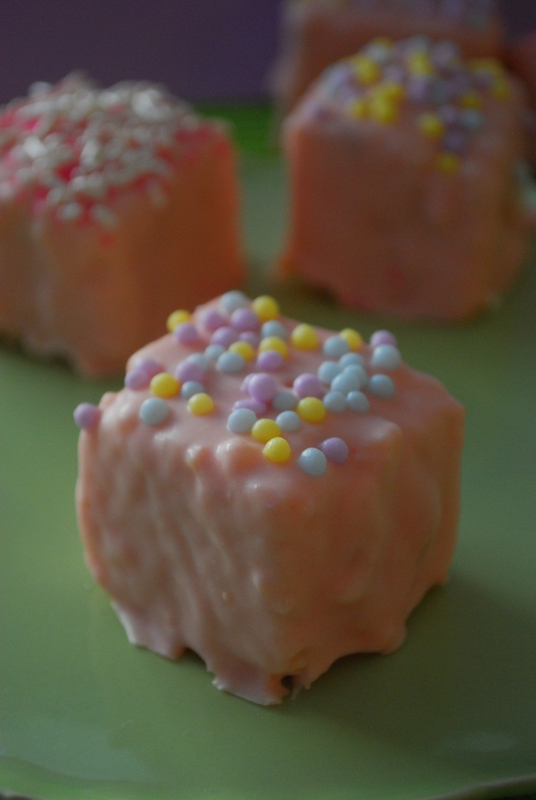 I love petit fours and I think these will be made easily – even for me!! 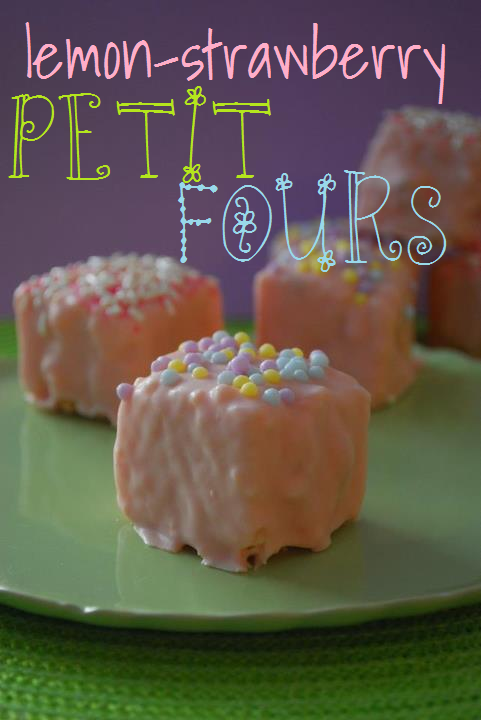 “Petit” meaning little and “four” meaning “if you make them just right, you can stuff 4 in your mouth !